To remove wallpaper glue, you don't need any advanced skills or exotic tools—only energy and time. Removing wallpaper is, in a word, laborious. The process takes a great deal of energy and time. And lo and behold, even once you think you’re finished, you’re not. 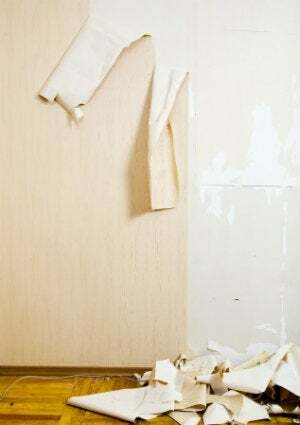 Stubbornly positioned between you and a smooth, clean wall, there still remains a smattering of stubborn wallpaper glue. Don’t worry—you can get it off. In fact, anyone can learn how to remove wallpaper glue. It doesn’t take any advanced skills or exotic tools. But much like the work you’ve done already to get this far, removing wallpaper glue requires patience and commitment. When you’re ready to power through to the finish line, continue reading the step-by-step instructions detailed below. We salute you! First, before you begin to remove wallpaper glue in earnest, get all furniture and accessories out of the room. If you can’t move everything, at least protect it with a plastic tarp. Use another tarp to cover the floors. As a further precaution, we recommend using painter’s tape to cover the electrical outlets in the room. In fact, it’s not a terrible idea to cut off power to the room altogether. The last thing needed to prepare the work area: trash bags, and plenty of them. Things are about to get messy! In a bucket, combine hot water, liquid dish soap, and a heaping tablespoon of baking soda. For particularly stubborn adhesive, add one cup of vinegar for every gallon of water used. Next, soak a sponge in the solution, squeeze out the excess liquid, and gently rub the sponge over a small section of wallpaper glue. Having done so, test the glue with your fingernail. You should notice—miracle of miracles!—that the wallpaper glue has softened considerably and seems willing to budge. With a rag, try wiping the glue off the wall. If it’s ready, a good portion of the glue will come right off. At that point, you can reach for the putty knife and scrape away any last lingering pieces. 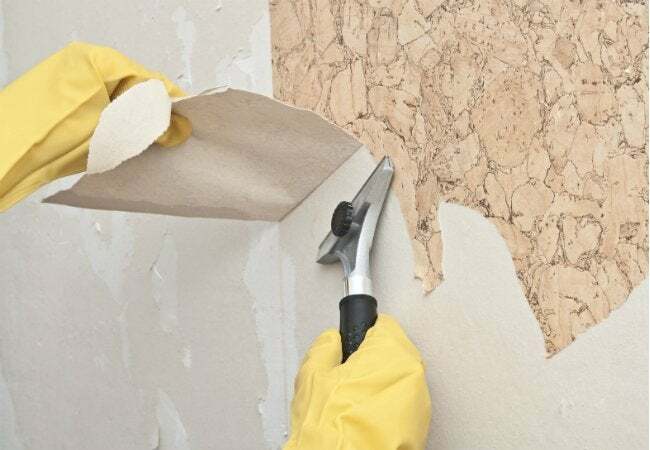 Because even a speck of leftover wallpaper glue can detract from a future paint job, it’s important remove wallpaper glue thoroughly and completely. Try and get every last bit. With a clean cloth, use circular motions to wipe the softening solution off the wall. Move on to the next section and repeat the process in step 3. One finished with the entire wall, let the room fully air out. Remove the painter’s tape and the tarps, and replace the furniture in the room—unless, of course, you plan to paint the room. If that’s the case, you’re basically all set to continue working—if you have any energy left, that is! If the wallpaper glue seems unfazed, consider purchasing commercial wallpaper remover. It’s not usually necessary, but different installers use different types of glues, some more stubborn than others.